A leading-edge text and HTML editor. Handle a stack of huge files with ease, format text, use a spell-checker, and perform system-wide searches and multi-line global replacements. Build document templates, convert text to HTML on the fly, and take charge of your code with a bunch of handy HTML tools. Use a power-packed scripting language to create anything from a text macro to a mini-application. Winner of top industry awards since 1998. Its Clipbook feature lets you create and organize clips, which can range from text macros to complete mini-applications, using a simple scripting language with enough features to satisfy any power user; a bunch of handy clip libraries is included. Web authors will love the HTML clip library, just one of a load of features that make NoteTab a great code-based HTML editor. Other gems include text-to-HTML conversion, tag stripping, and tools for adding links and color codes. Qweas is providing links to NoteTab Pro 7.1 as a courtesy, and makes no representations regarding NoteTab Pro or any other applications or any information related thereto. Any questions, complaints or claims regarding this application NoteTab Pro 7.1 must be directed to the appropriate software vendor. 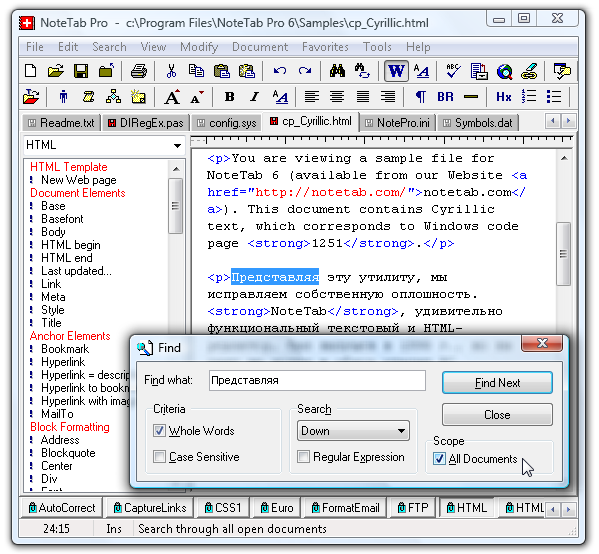 You may click the publisher link of NoteTab Pro on the top of this page to get more details about the vendor.